While we wait out our bout with Chicken Pox, and pause to see if siblings and dear small friends drop like flies, I’d like to turn the attention elsewhere. As I mentioned, a friend was also dealing with the dreaded issue of lice. Which I gather carries quite a stigma. But it is very common. Among children. Who think nothing of sharing hair brushes, hats, and even gum. But that’s a whole other issue. When I was in school, at the time the dinosaurs roamed the earth, I never heard of anyone contracting Lice. Probably because no one talked about it and at that time, if you were found to have Lice, you had to miss a week of school. Had I known about this ailment and the outcome, I would have sought it out. Nowadays, I understand that children don’t have to miss school. Making Chicken Pox the more desirable disease, as one must be quarantined. Which explains the new tic I’ve acquired. Anyhoo. My friend has been sharing with me a little of what she has to go through to rid her child of Lice. And I thought I’d share. Because I’m fascinated by the whole process. Not enough to want to experience it, but still. 1. 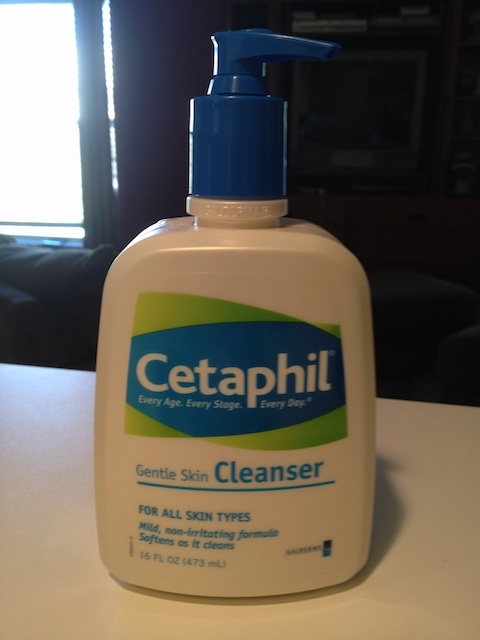 Apply Cetaphil Gentle Soap (not the face soap, but the one that’s made for the entire body) to the hair, as you would if you were applying a dye. For example, run a part at one inch intervals, saturating the scalp, and on through to the ends. Then you must use the high heat setting on the blow dryer and thoroughly dry the hair. 2. The hair will be nice and crispy at this point. Wherein you just go to bed. As it must stay on for 8 hours. 3. In the morning wash the hair. And then apply a vinegar rinse of about 1 cup of white vinegar to a pitcher of water. Taking care not to let it get into the child’s eyes, as it will sting. 4. After this step, you need to remove the nits with a special comb for such a purpose. I understand that CVS carries this for around $10. Seat the child under a bright light, and comb through a section at a time, rinsing the comb as you go. The whole process is time consuming, but it will save having to use a product with chemicals. Which I understand that the Lice of today are developing an immunity to. Lousy lice. I hope you never have to deal with this issue, but if you do, now you know what steps to take. And let’s hope I never have to speak of this again. As just thinking about it makes me want to scratch. Scratch like mad. For more Works for Me Wednesday tips, head over here! I have discovered the joys of drinking my breakfast. And no, this doesn’t include an orange and leftover champagne. For quite a while, I heard about the healthy benefits of juicing. Except when I was growing up, juicing was something you did to wheat grass, and I wanted no part of it. When I was researching healing whatever it was I was afflicted with last year (before my Lyme diagnosis) through healthy diet (and by “I” I mean Fiddledaddy because I was just as happy to take a pill and be done with it) he read a good deal about juicing. Specifically carrot juicing. We did buy one of those hoopty ploopty juicers that takes up far too much real estate on the kitchen counter. And I commenced with All The Carrot Juicing. I grew to dislike carrots with a white hot hatred. And I loathed the giant juicer even more because it took up so much room and cleaning the thing only made me more angry. I have kitchen appliance issues. I’m not ashamed to admit it. I did attempt some other types of juicing, but could not get the hang of it. Eventually I relocated the thing to another portion of the kitchen. And covered it with a table cloth. Then Fiddledaddy, never one to let things go, began researching Jason Vale, aka The Juice Master. His enthusiasm for juicing was infectious. He was also demonstrating a juicing machine that looked FAR EASIER than the monstrosity that now sat unused on my counter. A much smaller and CHEAPER juicing machine. Not to mention easier to clean. In a moment of weakness (end of the day/caffeine had all worn off) Fiddledaddy talked me into trying this different juicing machine. We found the Breville Juice Fountain Plus at Bed, Bath, and Beyond for $149.99 and were able to use a 20% off coupon, bringing the price down down to about $120. I’m proud to say that I’m juicing every single day. Sometimes twice a day. And let it be known that I have not forsaken my beloved Vita-Mix, and still use that for soups, green smoothies, protein shakes, etc., and of course my requisite blended coffee drink. 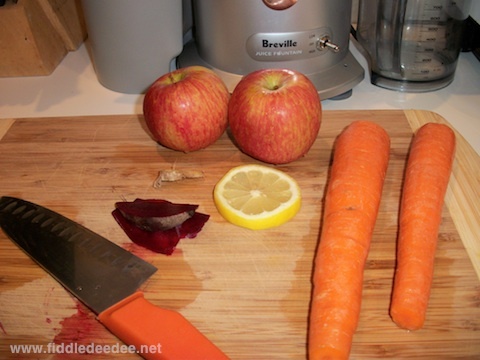 But today I wanted to share with you my favorite juicing recipe. Because of the wide mouth of the juicer, I can drop the apples in whole. Everything else goes in easily. There are a bunch of other wonderful recipes that include more greens, but this one is my all time favorite, especially first thing in the morning. I need at least one vice, you know. For more Works for Me Wednesday tips, head over to We are THAT Family! There were only 2 boxes of cake mix, and SIX boxes of brownie mix. There was a time, long long ago, when I was known to mix up a batch of chocolate cake mix, grab a spoon, and call it dinner. But the truth of the matter is that Publix was having a buy one get one sale on the Pillsbury Decadent Supreme Brownie mix, and I had two coupons for an additional buy one get ones. Which meant that I only spent I think 25 cents per box, or something ridiculous like that. And while I’m bragging, I wanted to tell you that I crossed the hump this week at Publix. I bought $175.27 worth of groceries for only $82.00. And yes, I still bought a lot of my organic produce, plus all the ordinary healthy stuff I usually feed my family. However, I heard on the radio about a technique of slicing the perfect tray of brownies. You use a plastic knife. Which was a pity, really. Because there wasn’t an ugly brownie in the bunch. So I packed up the entire bunch and shared. 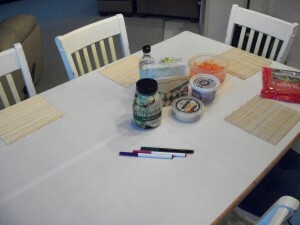 For more Works for Me Wednesday (even though it’s really Thursday) ideas, head over to Kristen’s at We Are THAT Family. I have wonderfully fond memories of warm evenings on our back porch in Ohio, catching fireflies with bare hands. I want to recreate these extraordinary childhood wonders for my own children as they grow. But alas, since we live in Florida, I can only offer them the wonder of the lovebug. 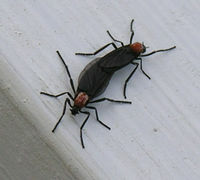 A lovebug is descendant of the fly family. But because they generally flit about in swarms, they more accurately resemble a plague. We warned the children not to smile when running for the ball. They in turn made a game of trying to catch the lovebugs in their mouths. While the onset of lovebug season is troublesome whenever you walk out of doors and inadvertently a pair ends up rattling around in your brain cavity, they are more offensive to the front of your automobile. While driving down the highway the other day, I thought I heard the unmistakeable sound of raindrops. It turned out to be a swarm of hapless lovebugs that met with an early demise, as their entrails were splattered all over the windshield. Lovebug guts on a car can spell body damage disaster if not removed immediately. Their tiny little body fragments become acidic is left for more than an hour or two, and can result in pits and etches in automotive paint and chrome if they are not removed. Fiddledaddy asked me if I had any dryer sheets. Since buying my dryer balls a few years ago, I’ve had no need to purchase dryer sheets. Dryer balls are a bonus tip for you today. Your welcome. I did recall that a box with one lone bounce sheet had fallen behind the dryer some years ago. And what with my housekeeping skills being so finely honed, I was banking on the fact that the box was still there. And it was. Along with some stray underwear, a hairball the size of a small cat, and an extra child we had forgotten about. Fiddledaddy came back in the house, sans the dryer sheet, a while later. “Success.” Dryer sheets are a most excellent way to remove pesky bug guts from the front of the car. You use them instead of a sponge or wash cloth, and with your favorite car wash soap. We use something called Rain-X. But I’m stumped as to how to get them out from the deepest recesses of my nasal cavity. For more Works for Me Wednesday tips, head on over to We Are THAT Family. We have made a ritual out of eating Vegetarian Sushi every week or so. And believe me, no one is more surprised than I am. Growing up on a steady diet of fried steak, bacon fat, and sweet tea, anyone who knew me would never believe I would enter mid-life as a healthy eater. And I’m not ashamed to admit that I just had a Smart Choice Chocolate Eclair just because I HAVE CRAMPS THAT WOULD KILL ANY MORTAL MAN. I am human. Anyhoo. On Sushi night, I always have a dilemma as to what China to use. Since I only have Fiesta Ware, the choice is easy. However, because the plates are rounded, my bamboo sushi mats will not lay flat. Even if you turn the plate over. And hit it with a hammer. My husband had a brilliant idea during one recent Sushi night. 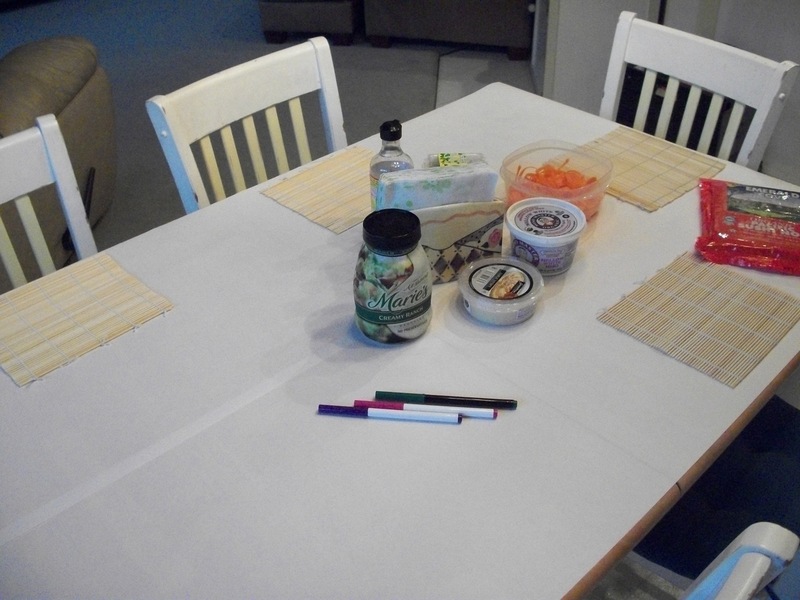 He covered the entire kitchen table with Reynold’s Freezer Paper. That way we could roll our Sushi right on the table. AND if you put the paper shiny side down and flat side up, the child who sits at the end of the table, is 5 years old, and has a Sushi Phobia, can eat his Morningstar Chicken Nuggets with a side of Jasmine rice, AND COLOR ON THE TABLE. Thusly ensuring me a mostly peaceful dining experience. Then after dinner, you can throw the whole mess away. Or clean it off as best you can, and let all the offspring display their artistic abilities the next day during breakfast. The only problem that we’ve encountered is that my 9 year old, the child who cannot bear to part with ANYTHING, has deemed all her artwork worthy keeping and can be found with scissors in hand cutting out any and all artwork before the table covering can be dismantled and thrown away. This slows things down if I’m, say, in a hurry to get the next meal on the table. Freezer paper, the poor man’s tablecloth. You won’t see it in any issue of Martha Stewart. But still, it’s a good thing. 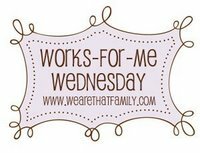 For more Works For Me Wednesday ideas, head over to We Are THAT Family! As the last installment of Works for Me Wednesday, Kristen had a splendid idea to repost/link/whathaveyou to our favorite post of 2010. A reflection of 2010, as it were. I’m certain that the majority of my blogging friends will be linking to their most inspiring and uplifting post. Instead, I’m going to leave you with my favorite vomit story of 2010. Because you know me, I love a good vomit story. This was how my year began in 2010, and frankly, it pretty much summed up the entire year for me. And so I wanted to re-share. On Sunday night, I was mentally preparing myself for post writing and catching up on “24”. The phone rang, and my BIL was frantic, saying that he needed to take my SIL to the emergency room. She had some sort of BAD stomach virus/plague/dysentery (or insert worse case scenario) and he was wondering if I could come over and watch their 3 boys while they were gone. I said OF COURSE, and grabbed my laptop thinking that at the very least I could get some work done after the boys were tucked safely in bed. When I arrived, I helped pack her up with a barf bowl for the ride, and a blanket for comfort. The boys and I settled in to watch a movie. I made a mental note to wash my hands frequently because if you’ll recall, over the week of Christmas my entire family contracted a hideous stomach virus (spoiler alert: this was my favorite vomit story for 2009) that prompted more than one of us to make out our last will and testament. This is the child that is known for his nervous stomach. I offered a comforting, “Dude, you’re going to be all right.” And before I could draw my next breath, he threw himself down on all 4’s and threw up on the Persian area rug. The ENTIRE house is either tiled or laminated, save for the 8×9 Persian rug. But he managed to throw up on the only rug in the house. He evidently had been saving up a good deal of groceries for this display, because I seriously considered simply rolling up the rug and throwing it out on the lawn. But clearer heads prevailed, and I knew the rug would be missed eventually. I started hollering out orders to the 2 other brothers, who continued watching “The Bible Story” DVD. GET ME A PLASTIC BOWL, WHERE ARE THE PAPER TOWELS? LYSOL, I NEED LYSOL. DO YOU HAVE ANY RUBBER GLOVES??? That’s when my eyes rolled into the back of my head and the room went dark. If you know anything at all about me, you would know that whenever vomit makes an appearance, I’m the first one that leaves the building. For everyone’s sake, really. Because if I even THINK someone is going to throw up, I’m certain to beat them to it. Unfortunately in this case, I was the only adult present. So I had to deal with the mess efficiently and immediately. As I was assessing the situation (read: praying like I’ve never prayed before for Jesus to come back right then and there) I heard the family dog click click click across the laminated flooring. Making a beeline straight for the pile of vomit. That scenario played itself out in my head and I knew I had to prevent it lest I loose consciousness and fall face first into the whole mess. What is it with dogs and vomit, anyway? Reason #254 why I don’t want a dog. So with one foot out keeping Rascal at bay, I piled layer upon layer of Bounty paper towels down over the mound of puke. And I scooped everything up and deposited it into an odor resistant top tie kitchen garbage bag. And let me just pause to tell you, I STILL FELT IT! I just made Conservationists everywhere groan with disapproval over the fact that I single handedly commandeered a land fill . I made the boys talk to me about ANYTHING other than what I was doing, and I tried to go to my happy place in my head while humming a merry tune. When everything was sufficiently cleansed, I made sure that nephew #2 had a nice large plastic bowl with him at all times. I told him that the bowl was his friend, and he must never be without it. The bowl came in handy 15 minutes when MONTEZUMA’S REVENGE struck him. Oh, that was a memorable bonding moment. I was grateful that my SIL kept a stash of scented candles positioned throughout her house, because every 2 minutes or so, I had to stick my head into one and just breathe deeply. Meanwhile, back at the emergency room, my SIL hadn’t been seen because Sunday night in Equator, Florida is an exciting place to be, what with all the gun fire and such. And when you are in the emergency room with a stomach flu, a gaping chest wound takes precedence. It looked like she would be there for the long haul, and she was in good hands there, so mercifully my BIL came back home to check on nephew #2. I’VE NEVER BEEN SO HAPPY TO SEE MY BIL IN MY WHOLE LIFE. In two steps, I was out to my car and aiming down the street towards home. There were more than a few mailboxes along the way that will never be the same. When I arrived, I boiled my hands and burned my clothes. And said a Hail Mary, even though I’m no longer Catholic. At 1:30 in the morning I got the call to go and spring my SIL from the ER. When I arrived, she was looking much better. She had been hydrated with an I.V. and had been given a shot for the nausea. She had the same thing we had in December. A stomach flu. A really bad one. And it seems that by this time of the morning, her husband called to report while freaking completely out that all 3 of her children had it coming out of both ends. Driving back home, with all the windows open, I asked her if she was sure she wanted me to take her home. Knowing she was heading straight into the pit of hell. I’m just kidding. I really didn’t slow down all that much. I talked to her today, and everyone is doing better. I’ll be sending over my recipe for Grandma’s Potato Soup. I would take a batch over, but I’m feeling a little green around the gills. Not even kidding. If you don’t hear from me for a couple of days, send Saltines. 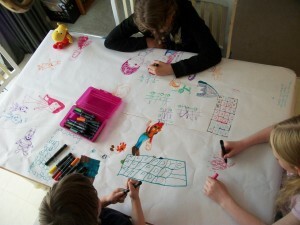 For more Works For Me Wednesday Reflections 2010, head over to We Are THAT Family! For years, I consider myself a major failure when attempting a rice dish with dinner. Unless of course, the recipe calls for Uncle Ben’s, a pouch, a pair of scissors, and 90 seconds in the microwave. But at $2.00 a pouch, and not nearly enough to feed a family of 5, I’ve been looking for other options. Options that do not include a boiling bag. As that rice tastes a good deal like stucco. And I should know, since I’ve been tempting to actually eat stucco during my recent 2 day “cleanse”. Enough said about that. A while back, I posted a White Bean recipe, and in the comments, a sweet reader named Gretchen told me about an oven rice recipe that she found at Kitchen Parade. This is a long grain brown rice recipe that requires the use of an oven. I tried it, and let me just say, that if I were to have any more children (WHICH I’M NOT), I would name one Gretchen, since she has single handedly changed my life with bringing this revolutionary rice recipe to my attention. I’ve made it no fewer than a half a dozen times over the last few weeks. And it has turned out AMAZING every single time. So I wanted to share it with you all. But don’t name your children after me. Especially since I was named after a stripper. I wish I were kidding. Preheat oven to 375 degrees. Bring liquid and Olive Oil to a boil in saucepan or microwave. Meanwhile, in an 8×8 (or equivalent) glass baking dish, stir together the brown and wild rice. Sprinkle with salt. Pour the hot liquid over the rice and gently stir, distributing the rice evenly throughout the dish. Cover tightly with a double layer of foil. I use a single layer of heavy duty foil. Or if you have a glass top that goes with your baking dish, use that. Bake for 60 minutes. Remove from oven. Fluff rice with a fork, then cover lightly with a paper towel and let rest for 5 minutes. Uncover and fluff again, wait 5 minutes. Then serve and prepare yourself for a multitude of complements. I can easily feed my hungry bunch with leftovers to spare. Prepare yourself for a bit of sticker shock when pricing Wild Rice. But since you only use 1/2 cup of it per recipe, a bag will last a good while. Another variation that I’ve discovered, is the addition of some sauteed vegetables, such as peppers, onions, and/or zucchini when you’re putting the recipe together, prior to baking. Uncle Ben, you are dead to me. For more Works for Me Wednesday tips, head over to We are THAT Family. A number of years ago when Jensen’s Atopic Dermatitis was incorrectly diagnosed with food allergies, I became pretty well versed with what Wheat Free, Gluten Free, and Dairy Free products were decent. After we found out his issues were topical only, I reverted back to cooking with glee, using whatever I found in my refrigerator that didn’t bite me first. The glory years of cooking. Fraught with pre-packaged meals that very likely had a shelf life longer than me. Now as I face my own health issues concerning R.A., my doctor has recommended that I cut dairy, wheat & gluten out of my diet. Goodbye ChocoVine, so long Oreos, adios columns of Ritz Crackers that simply melted on my tongue. Instead of concentrating on what I can’t have right now, I’m trying to play up all of the good products that I’m finding. And I wanted to share a few with you, because I’m amazed at how many people are also having to avoid this in their diet. 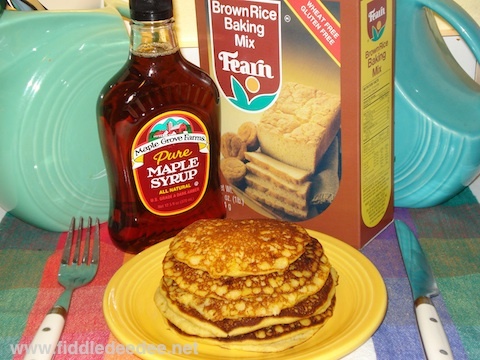 Baking Mix: I discovered Fearn Brown Rice Baking Mix years ago. I’ve kept it on my shelf, even when I didn’t have to worry about gluten because I love it so. It makes the most excellent pancakes. There is also a muffin and bread recipe on the package as well. And happily, I recently discovered that Wal-Mart carries this. Cake & Muffin Mixes: Namaste Foods makes the most amazing product when it comes to an easy flavored baking mix. I have found this at our tiny health food store (what I would not give for a Whole Foods Market in this town) and it’s a little pricey, but worth the splurge. My favorite is the Spice Cake Mix flavor. I make muffins from this mix, adding a little pureed pumpkin and protein powder. It makes a rather large batch, so I’m able to freeze a few for later. Protein Powder: This is a must have in my pantry. I’ve used this brand faithfully for the last number of years, even when I wasn’t wheat free. NutriBriotic makes a Vegan Rice Protein Powder, and I keep it in both vanilla and chocolate. The vanilla flavor works well in pancake and muffins. I use the chocolate flavor in my peanut butter/banana protein shakes. Now I simply use soy, instead of cow’s milk. Pasta: Rice pasta is tricky. I’ve tasted some brands that I think we’re made from my children’s Elmer’s glue. I’ve found one brand that I love even more than wheat pasta. Tinkyada makes not only rice spaghetti, elbow macaroni, but also rice lasagna noodles. My children actually prefer this over wheat, and I’ve been able to find it a Wal-Mart. It cooks a little bit longer than regular pasta, but the taste is always better. Chips: I’ve completely let go of my obsession with whole grain tortilla chips. We found a brand of brown rice crisps called Riceworks, in a Sea Salt flavor. There are no preservatives and the flavor is wonderful. I’ve found these also at Wal-Mart. Frankly, I’m pleasantly surprised at the variety of wheat/gluten free products I’ve been able to buy there. Cereal: This is a tough one, because I am a cereal FANatic. I’m still able to eat gluten free Rice Chex, but I’ve also found a cereal that takes me right back to my youth. Envirokidz makes an organic gluten free cereal called Gorilla Munch. I swear to you it tastes like Captain Crunch. I eat it sparingly because it has 8 grams of sugar in a 3/4 cup serving. But at least that sugar is from organic evaporated cane juice. And I’m able to buy it also at Wal-Mart. Tortillas: I make a chalupas every chance I get. I love Amy’s Organic Black Refried Beans (can), on top of a brown rice tortilla made by Food for Life. I have to spring for these at the health food store, but I can buy a few packages and freeze them. My favorite way to eat them is to first saute them in a little extra virgin olive oil to harden them up. Bread: Does it occur to anyone that I may be a little carb-centric? I love my carbs. I do have to limit them somewhat, but these rice based products make me feel like I’m not deprived. I truly believe that most rice breads are made by the makers of styrofoam. With only a few exceptions. A brand called Udi’s makes the most amazing gluten free/dairy free sandwich bread bread. I have only found this in the health food store. Margarine: I thought I would never find a margarine that I liked as well as my old standby Smart Balance. However, Earth Balance makes a wonderful vegan (and soy free) buttery spread made from natural vegetable oils. I can also use it in my cooking. Make sure you get the red package. And I’ve found it at Wal-Mart for about $3.00. Treats: I’ve never met a dessert I didn’t like. I have to have a few treats stashed about so that I don’t feel like someone is torturing me by taking away my ChocoVine. Pamela’s makes a delightful Chunky Chocolate Chip cookie that is wheat, gluten, and dairy free. I limit myself to one a day. My will power, it has at last returned. And since I’m confessing my dessert sins, I will tell you that I keep a small container of Haagen-Dazs all natural Mango Sorbet in the freezer. Hidden behind the frozen broccoli, so that no one is the wiser. I have days that a spoon and the sorbet are the only thing standing between me and a padded cell. There. Confession is good for the soul. Cheese: I’m a cheese head. I love cheese. I love to cook with cheese. So this is a tough one. I’ve tried rice based cheese products, and frankly, well, I hate them. Recently I was reading about a gluten, soy, and dairy free cheese by Daiya. Fiddledaddy just found it at the health food store and brought it home for me to peruse. I tasted it, and did not want to rip out my tongue. It will do very nicely, and it even melts. I’ve only tried the Mozzarella, but will be looking for other flavors. Frozen Meals: In a pinch, I’ve come to love an occasional organic Amy’s Frozen meal. Some are only gluten free, some are only dairy free, but there are a few that cover both territories. My kids adore their burritos. We’ve also made the decision to use more organic fruits and vegetables, as well as organic chicken and ground turkey. This has been an eye opening experience looking for the best prices. I tell you what, when you pay $6.00 for a small package of organic chicken breasts, you pay extra careful attention to your culinary skills and allow NOTHING to go to waste. And yes, I admit it, the taste of the organic is definitely better. This is all a learning experience. I’m having to re-think everything I cook, but in the long run, I know I will be serving healthier meals for my family. And perhaps expediting my own healing as I traverse the winding path of finding my way back to health from R.A. If you have any tried and true products that are wheat/gluten/dairy free that you’ve found (as well as cookbooks), I’d LOVE to hear about them! For more Works for Me Wednesday tips, head on over to Kristen’s at We Are THAT Family.